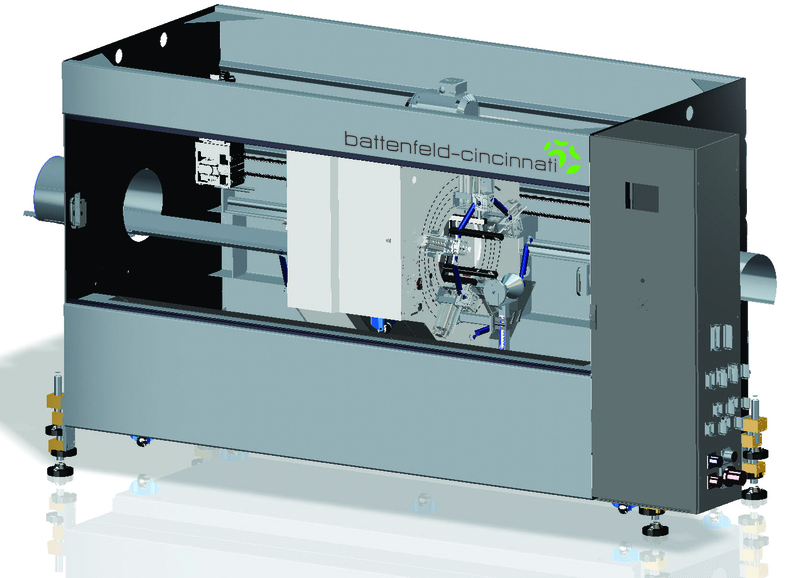 In addition to the new solEX GL series, the Infrastructure Division of battenfeld-cincinnati, Bad Oeynhausen/Vienna is presenting two more novelties for pipe manufacturers at this year’s K: the new helix-63-5 VSI 5-layer pipe die and the RTA 250+ automatic pipe cutter. With these two machine components, the extrusion specialist caters to the market demand for high productivity and flexibility with simultaneous low energy consumption. 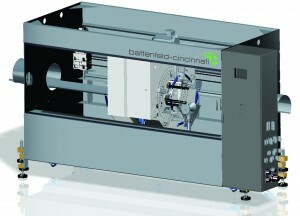 With the helix-63-5 VSI pipe die, battenfeld-cincinnati is adding a new pipe die size to its extensive product range. Now that 5-layer pipes with a layer of EVOH serving as an oxygen barrier and di-ameters of up to 32 mm have been established for some time in floor heating systems, the market now also requires these func-tional pipes in larger sizes. These are ideally suited as inlet and supply pipes in floor heating systems, or for laying in contaminated soil. Therefore the machine manufacturer now offers the new 5-layer pipe die for making pipes up to 63 mm in diameter and plans to add another new die to its portfolio in the near future as well, to accommodate pipe diameters of up to 125 mm. In the production of 5-layer pipes with an oxygen barrier, EVOH processing constitutes a special challenge. This is why, in designing this die, battenfeld-cincinnati has paid special attention to a short dwell time of the EVOH inside the die and optimal distribution of thin layers with extremely narrow tolerances. The helix-63-5 VSI die is based on a classic VSI die with the well-known two-step distribution concept consisting of a spiral mandrel distributor and a lattice basket. This structure ensures best possible distribution, homogenization and throughput with minimal pressure build-up. For the subsequent coex layers, a double mandrel is used as the basic distribution element, followed by either a spiral mandrel or a lattice basket, depending on the material. The modular design of the die facilitates its conversion for the produc-tion of 3-layer pipes, as well as disassembly for thorough cleaning. Minimal melt dwell times ensure short color changeover times. 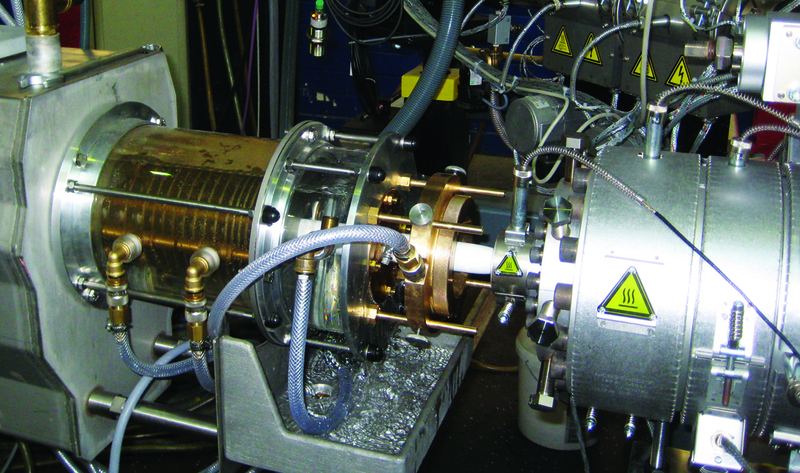 Finally, a choke for the two adhesive layers is responsible for regu-lating their flow rates from only one extruder. The Infrastructure Division is also showcasing the new RTA 250+ automatic pipe cutter at the trade fair booth, which, similar to its established predecessor models, operates with circumferential cut-ting tools. Thanks to a sophisticated mechanism, these function completely without electrical drives or hydraulics on the rotating cutter. 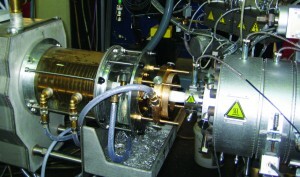 A novelty is the modular design of the RTA 250+, which enables pipe manufacturers to cut both PVC pipes (machined) and PE pipes (non-machined), as well as process pipes of different siz-es, ranging from 32 to 250 mm in diameter, and use between 1 and 6 cutting tools, depending on the material the pipes are made of. According to customers‘ preferences, the drive system for the cut-ter can operate either with a pneumatic cylinder to power the in-feed stroke or with an electro-mechanical drive. In the latter case, the infeed stroke is triggered fully automatically and can be ad-justed instantaneously to different pipe diameters via the control system without any interruption for changeover. Processors can also choose between an AC and a DC motor from the modular sys-tem to power the travel drive, depending on whether they need to cut the pipes to standard length or high-precision lengths. Apart from extreme flexibility due to its modularity, the new cutting system offers an outstanding technical performance: pipes with wall thicknesses of up to 50 mm can be cut at a maximum speed of up to 30m/min. Last but not least, the RTA 250+ features an excellent energy bal-ance. Since it functions without drive motors in the cutting blades, the automatic cutter operates with an extremely low ener-gy consumption. Where DC drives are used, the reclaim of decele-ration energy yields an additional increase in efficiency.